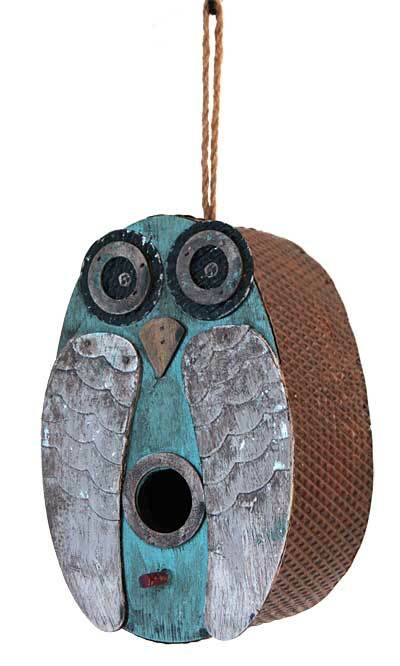 Add a whimsical and friendly owl to your bird garden with this Songbird Essentials Blue Owl Bird House. The recognizable face and wings on this home bring unique style to your bird garden, while the blue hue adds a bright look. Metal discs with raised wooden circles form expressive eyes, followed by a raised triangle that evokes a beak. Additional wooden ovals with scalloped detailing rest on the sides of this unit, mimicking wings, and a bottom, 1.125" diameter opening with perch completes the piece. This allows wrens and chickadees to enter the home in moments, and an attached, rope hanger makes placement simple. Diamond plate metal forms the frame of the shelter, and a cleanout panel on the back lifts for easy nest checks. The blue, brown, and gray tones of this home contrast your landscaping, while the classic materials remain durable for many seasons. Showcase owls and songbirds in your yard easily with this Blue Owl Bird House.